I'm happy to be a part of http://www.iamareader.com/2013/09/4th-annual-gratitude-giveaways-hop-sign-ups.html this fab giveaway which pays tribute to YOU - the sweet and kind folks who follow this blog and/or have taken the time to become a Facebook fan. November is all about giving thanks and being mindful of our many blessings. Let's face it - life can be hard. There is no denying the suffering on this earth that comes along with the human condition. That said - who among us can argue that even when - and perhaps especially when - times get tough, we each have a stockpile - be it large or small - of blessings we turn to which help us through. For many these include our families, our friends, our pets, our faith. And let's not forget our books that we escape to when we absolutely positively need a break from the rigors of reality. These are all on my list of things for which I am thankful. I'm also ever-grateful for the bounty of new friends I've made and continue to make through the many internet venues I roam - the likes of Facebook, Twitter, my website, this blog and so on. 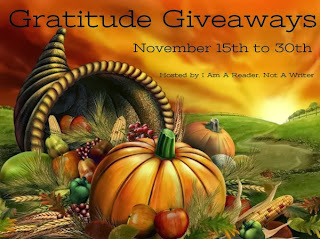 So - here's your chance to win a $10.00 Amazon e gift card, a small token of my esteem. All you need to do is choose ONE of the options on the Rafflecopter below (read more,) Just one will give you an entry. I hope you will all take a moment to think about and perhaps share with us, some of the things you are grateful for in your life. I'm really thankful for my family. I lost my dad last year 4 days before Thanksgiving, so I know how much my family means to me. Thank you for this giveaway. PS I'm sorry I clicked both entry :( i don't know how to cancel one! Kim - You're more than welcome to choose both entries. No worries. And Denise - that is beautiful. Thank you for commenting. Thanks for coming by, Ann and Barbara! Happy Thanksgiving and thank you for participating in the hop! I'm thankful for my family & our good health. Thanks for the chance for the giveaway. I'm thankful for my family and friends. My family is what I'm most grateful for. Happy Holidays! I'm always thankful for my best friend and confidante—my amazing mom. I follow by GFC as Toni Porter. Thankful for family & friends.